Express Employment Professionals takes a look at the glass ceiling. Celia Smith knows what it’s like for a woman to chart her own path in male-dominated industries. Before she opened her own network of Express Employment Professionals offices in Tennessee, she spent several years in the military and then worked at aerospace company Lockheed Martin. “If you go in there and have the skillset and believe it, you can do anything,” she said. Smith recognizes that women are underrepresented in certain sectors—she cites the skilled trades—but she believes they can overcome those challenges with sheer will. She says she’s always been competitive because of her skillset, and encourages other women not to impose limits on themselves. Still, according to statistics from the Department of Labor, the presence of women doesn’t measure up in certain industries. 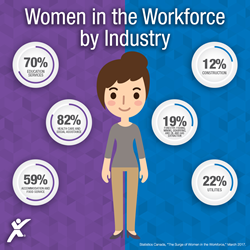 While women make up 74 percent of human resource managers, 65 percent of education administrators and 60 percent of pharmacists, they comprise only 11 percent of civil engineers, 26 percent of computer and information system managers and 27 percent of chief executives. Bettye Taylor, an Express franchise managing director in Oklahoma City, has first-hand experience with that disparity. Jessica Culo, who owns three Express offices in Edmonton, Alberta, Canada, agrees that women are underrepresented in the skilled trades, and notes that women often face unique challenges when applying for jobs, typically related to balancing family demands. Single moms, for example, often have to worry about needing time off to pick up children from school. “You don’t really see men asking for that,” she remarked. Helping employees and potential employees have flexibility in their schedules can make a world of difference, said Culo. “An hour here or an hour there” can be the difference between a qualified female job candidate being able to take a job or having to turn it down due to other demands. Christi Patrick, a developer and Express office owner in Nashville, Tennessee, agrees. Patrick also notes there are still workplace attitudes that can stand in women’s way. Culo agrees that it takes longer for women to build trust when surrounded by men and encourages other women to find a mentor while getting out of their comfort zone. She joined a 150-member entrepreneurs group, where she was one of only eight women. “It’s helped me to not be afraid to be creative and also realize there is no ceiling,” she said. Fortunately, a local organization based in Edmonton, Women Building Futures, is helping to close the gender gap for skilled trades. The government funded 16-week-program trains 30 women on basic carpentry, plumbing, welding, or sheetrock work, as well as focuses on soft skills needed in the industry. Culo said they would eventually like to be able to place the program’s graduates at client companies. In Tennessee, Smith has taken it upon herself to be a mentor to women. “You build on their strengths and, up to a point, on their weaknesses so they can compete,” she said. Smith, Taylor, Culo and Patrick all demonstrate that it’s possible for women to succeed in traditionally male-dominated environments, despite real challenges and discouraging attitudes that still must be overcome. If you would like to arrange for an interview with Jennifer Anderson, Vice President of Marketing and Communications, to discuss this topic, please contact Sheena Karami, Director of Corporate Communications and PR, at (405) 717-5966. Robert A. “Bob” Funk is chairman and chief executive officer of Express Employment Professionals. Headquartered in Oklahoma City, the international staffing company has more than 770 franchises in the U.S., Canada and South Africa. Under his leadership, Express has put more than 6 million people to work worldwide. Funk served as Chairman of the Conference of Chairmen of the Federal Reserve and was also the Chairman of the Federal Reserve Bank of Kansas City.